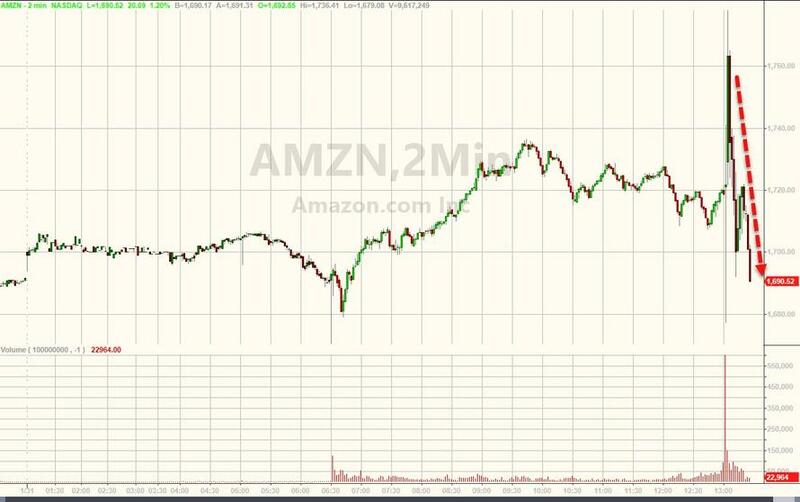 After two months of dramatic volatility in its stock, which saw the share price of Amazon first tumble to close 2018 then soar by in the past month, Jeff Bezos' online retailing titan was expected to report blow out earnings after what the company said was a record holiday period (while news of Bezos' divorce from his wife came and went without affecting the stock), and moments ago Amazon did not disappoint, when it reported both EPS and revenues which handily beat expectations, even as it reported guidance guidance for the current quarter that came in well below Wall Street estimates. A somewhat troubling trend to some, Amazon's revenue growth has been slowing in recent quarters, and in Q4 came in at 19.7%, the slowest since Q1 2015. 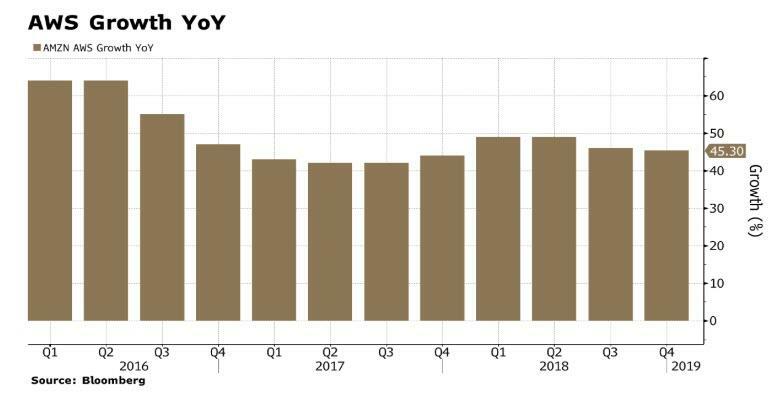 And while Q4 revenue growth was nearly 20% year over year, a strong if slowing number, it came amid a friendly backdrop of high consumer confidence, which was mirrored by robust chain-store sales. Moreover, it was the lowest year-over-year revenue growth for the company since mid-2015 as Bloomberg notes. Offsetting the strong, if slowing, historical numbers, however, Amazon guided Q1 net sales to be between $56 billion and $60 billion, which however was below the consensus est. of $60.99B. 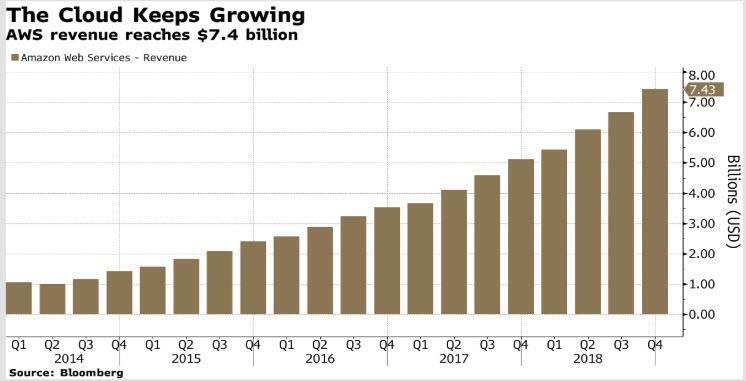 Meanwhile, operating income is expected to come in between $2.3 and $3.3 billion, compared with $1.9 billion in Q4 2017, and also roughly in line with consensus estimate of $2.99 billion. Also it is worth noting that the midpoint of the first-quarter revenue guidance - $58 billion - would represent year-over-year growth of just 13.6%. 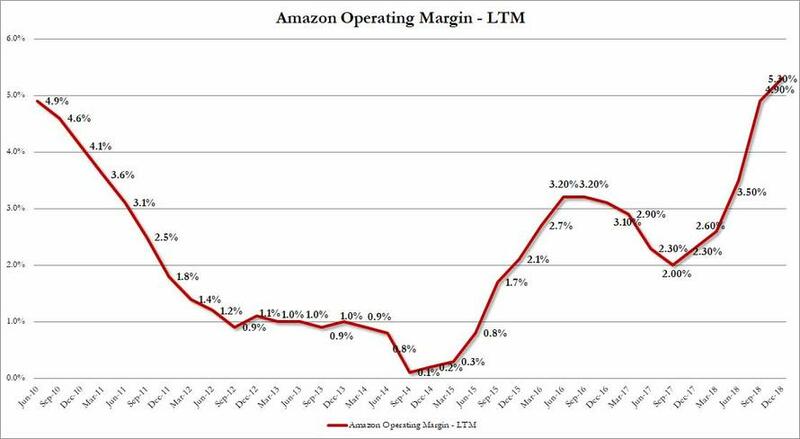 That would be the lowest for Amazon since the recession of 2001. Commenting on the revenue slowdown, during the conference call, AMZN's CFO Olsavsky highlighted headwinds from foreign exchange rates. Excluding those, the company sees its revenue growth as between 12% and 20%. He also highlighted the uncertainty around sales in India amid the implementation of new e-commerce rules on foreign online marketplace operators like Amazon and Walmart’s Flipkart. In any case, slowing revenue was offset by stable and growing profit margins (if not sequentially in Q4, when operating margin declined from 6.6% to 5.2%), and it will be up to the market to determine whether profits are increasing enough to offset the slowdown in overall growth. As RJ Hottovy, analyst at Morningstar, notes, "The story is transitioning from pure growth to growth and profitability. AWS is generating profits and advertising is becoming a bigger contributor. Some investors have been worried about Amazon fatigue, but this shows it's a pretty indispensable part of consumers' lives." Going back to the historical data, the all-important Amazon Web Services unit, or AWS, posted sales of $7.4 billion, versus the $7.3 billion analyst outlook. Amid worries about whether business technology spending might be wavering, AWS’s sales growth rate dipped fractionally to 45% from 46%. Despite the modest decline in annual revenue growth, a year ago consensus seemed to be that competition from Microsoft and Google would cut into AWS’s growth, but that has yet to happen. The division remains the leader in the rapidly growing cloud computing space, and a perhaps a leading candidate to secure the Department of Defense’s lucrative $10 billion Jedi contract. 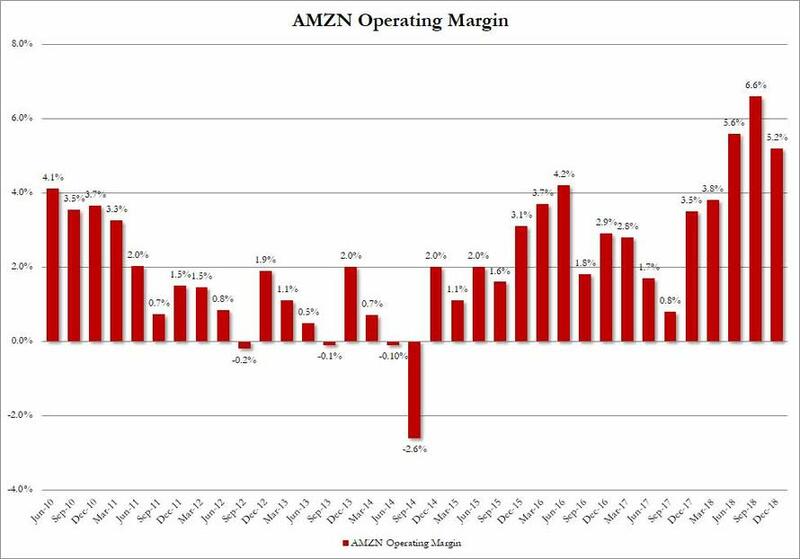 On the bottom line, AWS was responsible for operating income of $2.2 billion, a 29.3%profit margin, down from 31.1% last quarter but up from the 26.4% a year ago. In other words, for yet another quarter, AWS was responsible for more than half, or 62% of Amazon's total operating income. In addition to AWS, another bright star was Amazon’s advertising business, which as Bloomberg notes, "continued to be a star" with sales in the company's “other” category, which is mostly advertising, nearly doubled from a year ago, to $3.38 billion. Like cloud computing sales, advertising is more profitable for Amazon than its core retail unit. Now the not so good news: perhaps as a result of the recent price cut at Amazon's Whole Foods chain, revenue declined 3% year-over-year in its "physical stores" - a category that mostly includes Whole Foods and also Amazon's chain of bookstores. The revenue figure was worse than analysts had expected. Another potential red mark this quarter: Amazon’s subscription services, mostly Amazon Prime, saw a sharp slowdown, growing by 26% from a year ago, down from 50%+ growth rates in recent quarters. This may be the result of Amazon raising the price of Prime and its quick-delivery perks in the U.S. to $119 annually last year. Expect analysts to ask management on the conference call later how the price hike is impacting retention and new memberships. 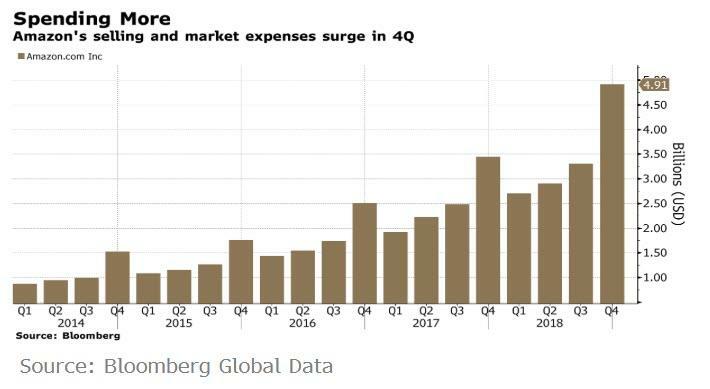 And then note the surge in Amazon's selling and marketing expenses, which just surged higher. As Bloomberg's Shira Ovide notes, one other spot of growth worry: paid unit sales, which counts individual items sold on Amazon websites, saw year-over-year growth figure slow again to 14%. 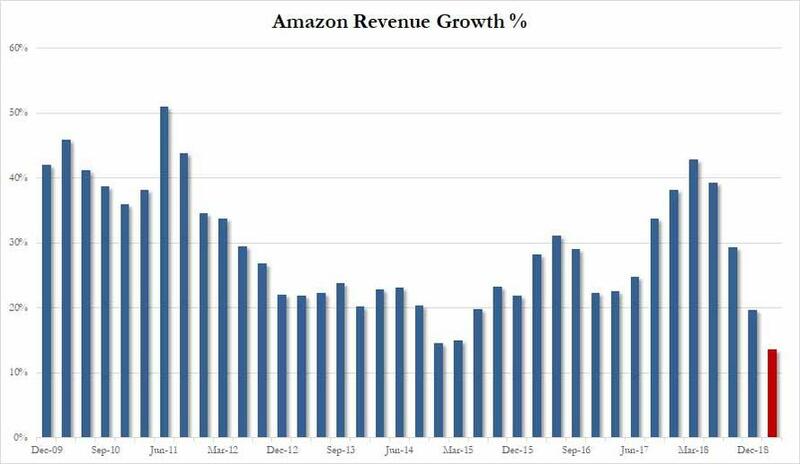 That could be a sign that total revenue growth is slowing not only because of a shift by Amazon from selling its own merchandise to being a conduit for merchandise sold by outside companies. “Alexa was very busy during her holiday season. Echo Dot was the best-selling item across all products on Amazon globally, and customers purchased millions more devices from the Echo family compared to last year. “The number of research scientists working on Alexa has more than doubled in the past year, and the results of the team’s hard work are clear. In 2018, we improved Alexa’s ability to understand requests and answer questions by more than 20% through advances in machine learning, we added billions of facts making Alexa more knowledgeable than ever, developers doubled the number of Alexa skills to over 80,000, and customers spoke to Alexa tens of billions more times in 2018 compared to 2017. 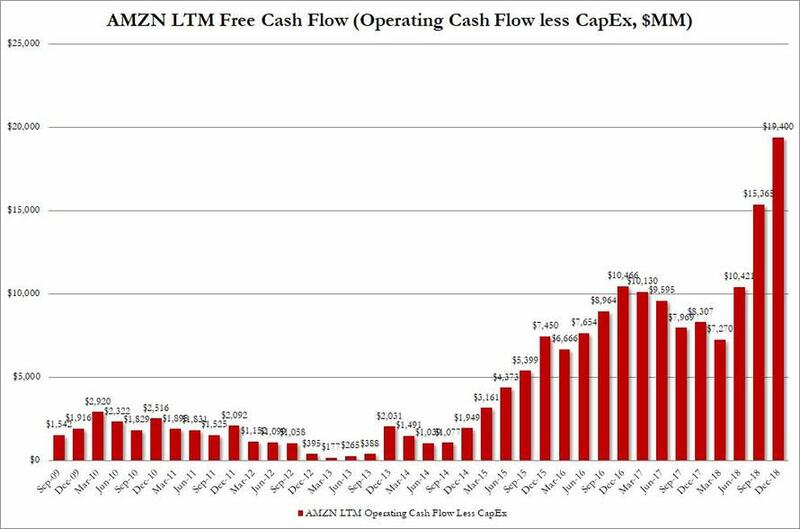 So before Alexa murders everyone in their sleep, for those still concerned about AMZN's cash burn, here is an update on the company's reported LTM Free Cash Flow in Q4 of $19.4 billion, a new all time high. Meanwhile, as noted above, after the company consistently grew its global net sales in past years, in Q4 this number dipped further, from 35% in Q3 to 30% in Q4 even as total headcount increased from 613K to 648K. 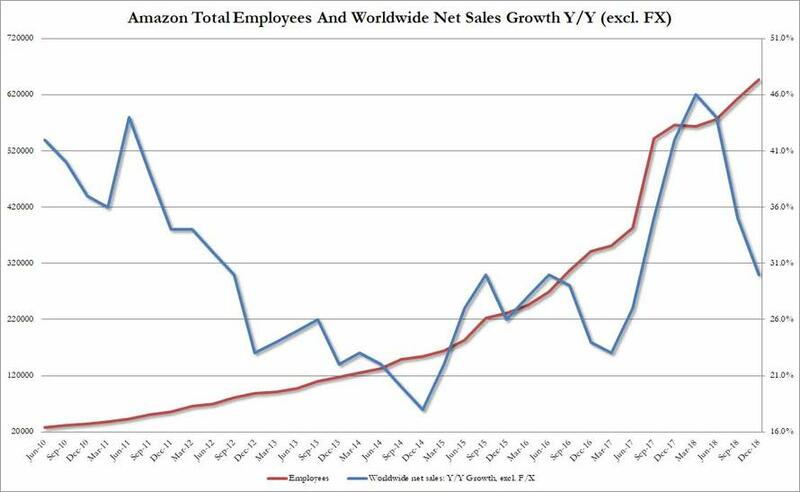 As a reference, at the beginning of 2017, Amazon employed around 350,000 full- and part-time workers. It is nearly double this number less than two years later. As noted above, the kneejerk reaction was initially positive, but investors may have been spooked by the company's poor Q1 guidance, and as a result the stock has slipped modestly after hours.